Musical celebrations are now everyday events, but musical concelebrations are still rare enough be be newsworthy. 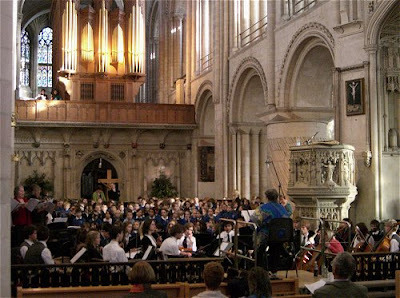 Last night saw a noteworthy premiere in Norwich Cathedral with two remarkable women and a collective force of more than three hundred young musicians as the concelebrants . 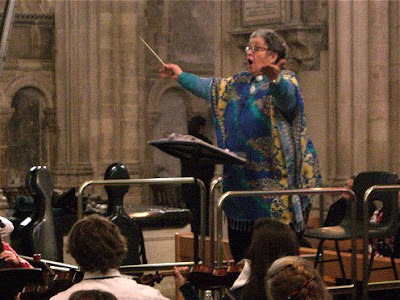 Composer June Boyce-Tillman, who is seen in my header photo conducting last night's premiere, was one of the women celebrants. She has pioneered the introduction of composing and improvisation into school classrooms, she is an authority on Hildegard of Bingen, is active in promoting the role of women in music and leads composing workshops for women. The link between music and theology is another of her special interests and for some years she has used music to encourage interfaith dialogue. Her community music making focuses on spirituality and music, and she is the founder of the Hildegard Network which brings together healing, the arts and theology. Julian of Norwich, one of the greatest English mystics, was the other remarkable woman celebrant last night. Born in 1342, Julian survived a near fatal illness during which she received a series of mystical visions. Following this she became an anchoress in a small cell in the city of Norwich where she meditated on the meaning of her visions. While an anchoress Julian was inspired by her visions to write The Revelations of Divine Love which is thought to be the first book written in the English langauge by a woman. The strength of Julian's visions has radiated far beyond the established churches. An edition of The Revelations of Divine Love published in 1901 brought her writings to popular attention, their importance was confirmed by a Penguin edition in 1966 and the book has never been out of print over a 110 year period. The Revelations of Divine Love is now regarded as a global spiritual classic, it has been an important influence on feminist theology and is quoted in the last of T.S. Eliot's Four Quartets. Last night's premiere was Enfolded in Love, a musical pageant celebrating Julian of Norwich composed by June Boyce-Tillman to a commission from the Friends of Julian of Norwich. 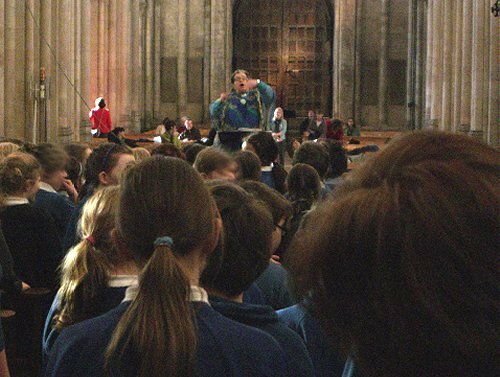 The performers seen in my photos were the other concelebrants, a chamber orchestra and large choir, all drawn from Norwich schools with ages 8 upwards, plus a soloist and a group of three folk singers acting as narrator, all female. Now I am well aware that the appearance of words such as schools, pageant, and feminist theology means I will have been hemorrhaging readers in large numbers over the last few paragraphs. Which is a great pity, because June Boyce-Tillman has long ago taken on board the lesson that Benjamin Britten taught so well; music written for children does not mean music written down to children. Enfolded in Love is not compromised by being written for performance outside the usual "serious music" environment. It uses daring harmonies and challenges the performers and audience with thematic juxtapositions of plainsong, traditional secular tunes and Lutheran chorales. It introduces non-classical elements such as improvisation and follows Bach and Britten in dismantling the barrier between performer and listener with congregational hymns. And it uses the unique performing space of a magnificent Norman cathedral to deploy spacial and theatrical effects. With no interval and a duration equalling Mahler's longest symphony Enfolded in Love could have been a very long listen for an audience drawn by the performers rather than the music. But not a bit of it. Like musical celebrations, standing ovations are now everyday events. But, despite this, the ovation received by the young performers, by June Boyce-Tillman and by Julian of Norwich is still newsworthy. Which is a great note to end on. But... last night's performance was not a regional or local event. June Boyce-Tillman lives in London, she is professor of applied music at the University of Winchester and her books have been translated into Dutch, Japanese, Portuguese and Polish. Yet, despite this, I looked in vain at last night's performance for any of the mainstream music journalists who repeatedly pronounce on the future of music education from nearby London. It seems a woman composer/conductor travelling from Winchester to Norwich with a little help from a medieval mystic is not as newsworthy as a male conductor travelling from Venzuela to London with a lot of help from the commercial/intermediary complex. * The remarkable musician who was the first woman to conduct the Berlin Philharmonic Orchestra can be met here and there is another youth orchestra in action here. My photos were taken under the almost impossible constraints now imposed by schools on photographing their pupils. Although untypically distant I hope they convey something of the atmosphere in Norwich Cathedral while meeting the myriad and frankly sometimes baffling requirements of the schools and others. All photos (c) On An Overgrown Path 2011. Report broken links, missing images and errors to - overgrownpath at hotmail dot co dot Also on Facebook and Twitter. What a wonderful post. For me it combines lots of new information with long standing concerns. That coda with, "I looked in vain at last night's performance for any of the mainstream music journalists who repeatedly pronounce on the future of music education from nearby London", was especially striking. It's some kind of human trait to be able to get comfortably in a rut of received thinking and not even be aware of it, as I know from personal experience. You can only get out of it once you've realized you're in it, so what you're doing in the first step of bringing about societal change.